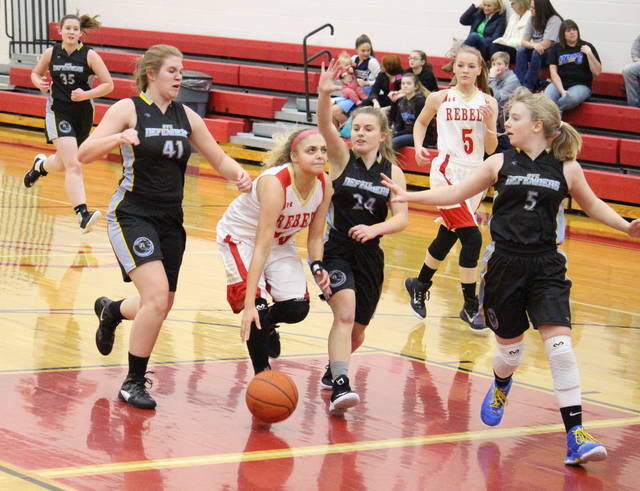 OVCS junior Emily Childers (33) leads SGHS freshman Makayla Waugh (left) on a fast break, during South Gallia’s 50-17 victory on Friday in Mercerville, Ohio. South Gallia sophomore Christine Griffith (24) shoots a layup during the Lady Rebels 50-17 victory on Friday in Mercerville, Ohio. 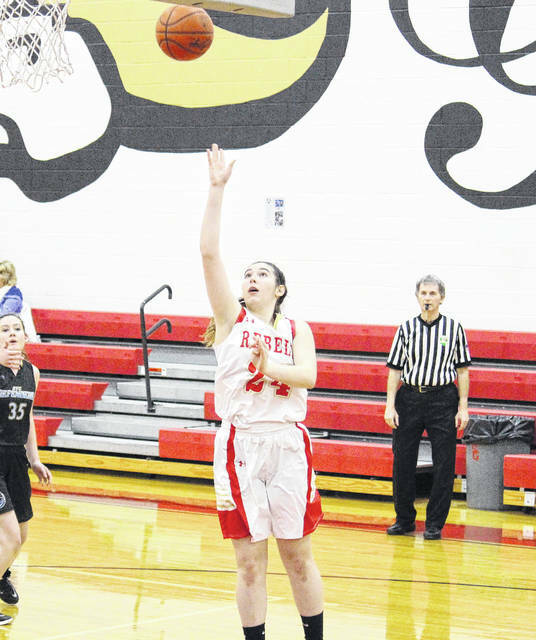 MERCERVILLE, Ohio — The Lady Rebels are headed into the new year with a winning streak. 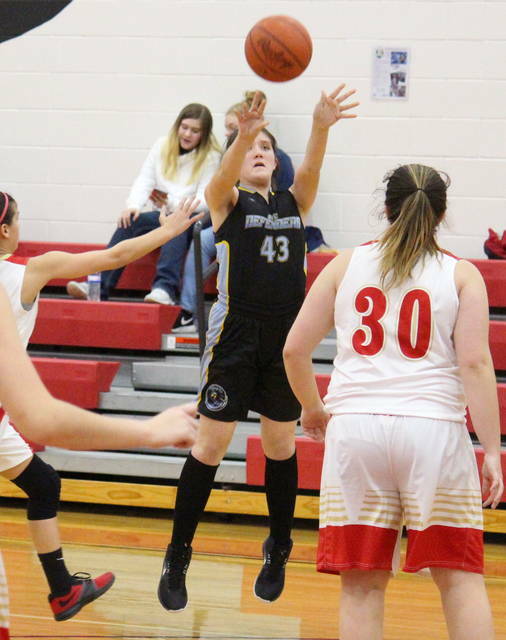 The South Gallia girls basketball team picked up its second straight victory and its third in four games on Friday night in Gallia County, defeating non-conference guest Ohio Valley Christian by a 50-17 tally. The Lady Rebels (3-6) broke the scoreless tie with a free throw 24 seconds into play and led the rest of the way. The hosts held Ohio Valley Christian (2-7) to just one field goal over the opening eight minutes and led 16-2 by the end of the first quarter. South Gallia outscored the guests by a 19-5 clip in the second period, stretching the lead to 35-7 by halftime. 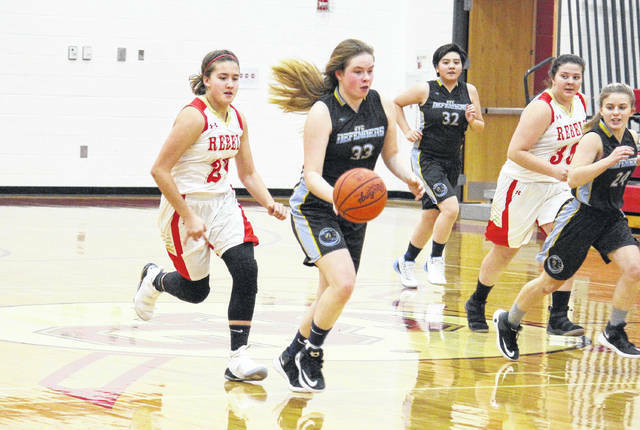 The Lady Rebels went on a 10-to-5 run in the third quarter and headed into the finale with a 45-12 advantage. Both teams scored five points over the last eight minutes, capping off the Lady Rebels’ 50-17 win. For the game, South Gallia shot 20-of-62 (32.3 percent) from the field, including 3-of-13 (23.1 percent) from three-point range. Meanwhile, OVCS shot 7-of-21 (33.3 percent) from the field, including 2-of-8 (25 percent) from deep. Both teams made 50 percent from the free throw line, the Lady Rebels going 7-for-14 and the Lady Defenders making 1-of-2. The hosts won the rebounding battle by a 29-to-23 clip, including 19-to-2 on the offensive end. Each team blocked one shot, but SGHS claimed advantages of 12-to-4 in assists and 27-to-6 in steals. The Red and Gold committed 14 turnovers in the win, while the Blue and Gold gave the ball away 43 times. The Lady Rebel offense was led by Erin Evans with 16 points on five two-pointers and a pair of three-pointers, all of which came in the first half. Evans, a senior guard, also recorded game-highs of three assists and six steals in the win. SGHS senior Olivia Hornsby scored nine points on three field goals and a trio of free throws, while Aaliyah Howell hit one triple, a pair of deuces and one free throw en route to eight points. Christine Griffith, Amaya Howell and Kiley Stapleton each had four points for the victors, with Griffith pulling in a game-best six rebounds to go with the hosts’ lone rejection. Makayla Waugh and Gabby Spurlock rounded out the Lady Rebel total with three and two points respectively. OVCS junior Emily Childers led the guests with five points, five rebounds and two assists. Lauren Ragan and Lalla Harlow each made a trifecta and finished with three points apiece, with Harlow leading the Ohio Valley Christian defense with a steal and a block. Cori Hutchison, Acacia Peck and Makala Sizemore rounded out the Lady Defender scoring column with two points apiece. These teams are slated to rematch on Jan. 15 in Gallipolis. South Gallia will get back to work in the Tri-Valley Conference Hocking Division on Thursday when it hosts Trimble, while Ohio Valley Christian returns to action on Friday when it welcomes Ironton St. Joseph.